It’s Thanksgiving week in New York City. It’s a time for people to consider what they are thankful for; to count their blessings. I can speak for everyone at Main Events and say how thankful we are to have the opportunity to put on a show for boxing fans at the greatest venue for boxing in the United States, Madison Square Garden. We’re thankful we can offer these talented, dedicated athletes the chance to reach for their goals and better their lives through boxing. Tickets starting at $50 are still available through Ticketmaster and the Madison Square Garden box office for Saturday’s event or you can watch live on HBO World Championship Boxing® starting at 10 p.m. Eastern and Pacific Time. Our card features two bouts in the competitive light heavyweight division: Sullivan Barrera vs. Felix Valera and our main event, the Next Chapter in Sergey Kovalev’s career, the WBO Light Heavyweight World Title fight against Vyacheslav “Lion Heart-Chingonskyy” Shabranskyy. The opening bout of the HBO telecast brings together two action-oriented junior lightweights, Jason Sosa and Yuriorkis Gamboa, in a must win 10-round fight. On our off TV undercard, we have three talented and undefeated Eastern European fighters out of the famed Boxing Laboratory in Oxnard, California with Bakhram Murtazaliev, who is co-promoted by Main Events and Krusher Promotions, facing Carlos Galvan in a ten-round super welterweight bout, a battle of the unbeaten between middleweights Meiirim Nursultanov and Eric Moon and Enriko Gogokhia versus Jose Antonio Abreu in a welterweight showdown. And, a little treat for all the New York fans, we have three born-and-bred local fighters getting the chance to perform in front of their friends and family on Thanksgiving weekend. They include Brooklyn’s Frank Galarza making his Madison Square Garden debut against Jaime Herrera, Long Island-native LeShawn “Lightning” Rodriguez, who has promised to put on his own Winter Spectacular versus Alex Duarte and, making his pro debut, Ismael Villarreal, from the Bronx, will face Race Sawyer. We are thankful to our sponsors Medoff Vodka and Leon.RU. We are thankful for all our partners in this card; working with so many good people proves you cannot succeed alone. I want to thank Golden Boy Promotions, Shuan Boxing Promotions, Peltz Promotions and Krusher Promotions for a wonderful working relationship making this event possible. I want to thank HBO, especially Peter Nelson and Tony Walker, for their unwavering support. We will not let you down. As always, we thank you for the opportunity. I want to thank all the press for being here. It’s a great privilege to be associated with such a great event and to see you all turn out here before a holiday. I want to thank, first and foremost, everyone at Main Events, constant professionals. We always know we can rely on Main Events to, not only deliver us a great show, but also on the undercard, off HBO, Kathy is giving us a glimpse into the future. The fighters she just named are all apart of budding generation you will be seeing on HBO in the coming years. I would also like to thank the different parties working together in order to make this event happen, obviously Krusher Promotions as well as Golden Boy Promotions. I want to thank everyone on team Barrera as well as team Valera, in addition to Russell Peltz. This guy gives the best talks in all of boxing and he is just sitting there right now. I don’t understand what we are doing here. Every time he gets up here he schools everybody. You never want to talk after Russell Peltz. I want to thank everyone who is really committed to making the best fights in boxing and constantly working together in order to do that. It is important to work with people who want to put the fights together that the fighters want. They have to be willing to work with anybody, anywhere and the fighters we want on the network are the ones who want to fight anyone, anytime and anywhere. As I can attest with all these fighters up here, I have never had that problem with any of them. They have never turned down a fight. Those are the kind of fighters people want to watch. Those are the kind of fighters that make the fights people want to see. And those are the kind of fights that lead to bigger and better things for each of the fighters involved. Our start time is 10 p.m. and we have a triple header. We have all action fights on HBO. In the super featherweight division with Jason Sosa and [Yuriorkis] Gamboa are going to compete in order to see what the big next step is to come in their career. The light heavyweight division, as Kathy said, is a stacked division. Two great fights there. Maybe we see the winners meet up down the road. We see some others fighters who are in great position to try and take dominance over an open division right now and have a world title fight like Sergey vs. Shabranskyy. If you aren’t going to be at home or watching it on television, set your DVR. Hopefully you will be at the arena on Saturday night. We look forward to seeing you all. Thanks very much. I really want to welcome everybody here to this final press conference at MSG. This is really an exciting time at The Garden as we get ready to host three consecutive weekends of great fights. We haven’t done that since the 1960s. The two guys that are fighting this weekend will follow in the footsteps of all the great boxers and fighters that fought in the MSG ring. Sergey is really one of the best pound-for-pound fighters in the world and we know that he is ready to start the next chapter of his brilliant career. We are thrilled to host the light heavyweight world championship fight between Sergey and Vyacheslav. It will be another night in a long history of great fights at The Garden. As all you know The Theater is actually a tremendous place to host a fight and view one. We are sure all the loyal fans will come out. It’s just going to be a great atmosphere on fight night with top quality boxing at The Garden. Those two things are synonymous. The Garden has been in the boxing business for over 130 years. This will just add to the rich history of all the MSG fighters: Sugar Ray Robinson, Ali, Joe Frazier and the list goes on and one. As I said this kicks off three fights in a row. Three weekends in a row so it really is an exciting time for us. I really want to thank Kathy, Peter, their staffs from myself, Sal Federico and my staff. It’s just been great to work together with everybody. I want to take this time to wish everybody a Happy Thanksgiving. As Kathy said its Thanksgiving weekend and for everybody to come out is great. Hopefully everyone has a great Thanksgiving, a great holiday and end it with a great night of boxing here at MSG. I look forward to seeing everyone and have a great holiday. Finally, to the media present and watching live, thank you for your time and attention. I promise you, in the months and years to come, you’ll remember you were here to witness The Next Chapter in Sergey Kovalev’s career. We have an exciting undercard – this is a full Thanksgiving meal with plenty on the table. Opening our bout on the HBO card is former unified featherweight champion Yuriorkis Gamboa (27-2, 17 KOs) stepping in to fight former WBA World Super Featherweight Champion, Jason Sosa (20-2-4, 15 KOs) in a ten-round super featherweight fight. Gamboa is a native of Guantanamo, Cuba, an Olympic gold medalist. This is a fight he wanted. Sosa is one of our many local fighters on the undercard, from Camden, New Jersey. These guys both want to start the next chapter of their careers on a winning note. When they get to this part of the press conference, they start with the main event. Teddy Brenner was the greatest matchmaker in the history of boxing. For those of you who don’t know who he was, he was the matchmaker here at MSG from the late 50s to the late 70s before that he ran what they call the House of Upsets in the Eastern Parkway of Brooklyn where about a third of the 200 main events he made became rematches in The Garden. No one will ever surpass Teddy because Teddy promoted fights, he did not promote fighters. He had three criteria for what made a good fight: 1. Do the styles mesh? Gamboa and Sosa are each 5’6. They each try to hurt people. 2. Does the fight lead somewhere? The winner has been promised a shot at a world title. 3. The most important is, would I buy a ticket to see this fight? Absolutely. That’s why I think it’s the most compelling, the most intriguing, the most interesting fight on this card. Gamboa cannot afford a loss. People say he is washed up. He is 25-2. I don’t know how washed up you can be at 25-2. We expect to see the best Gamboa there has been. The one I have ran into here a few years ago when he knocked out a fighter I had Rogers Mtagwa. Jason Sosa is coming off a defeat to Lomachenko and I was in the dressing room with him after that fight. It was a tearful scene. Peter Nelson from HBO came in and said, ‘I promise I won’t forget what you did for us this night. You stepped in when no one else wanted to fight Lomachenko at that time for any reasonable amount of money.’ Jason took the challenge and everybody said it’s the end of his career and here we are back again. Peter made good on his promise and we are one fight away from fighting for the world title. We would love to fight any of the guys that are fighting on the HBO show on December 9th.When Robert Diaz or Eric Gomez or Peter Nelson call me I don’t even say hello. I say will take it because that’s what fighters do; they fight. I’m really looking forward to this thank you. First I don’t really have a lot to say because tomorrow is Thanksgiving and we are not gonna have the privilege to eat at least four or five plates. I would just like to give thanks. Thanks to the media. Thanks to Peter Nelson and Main Events. I am thankful for my family, my two kids and my mom. And I’m thankful for the opportunity to, once again, showcase my talent on HBO. First and foremost I want to thank the man up above; without him nothing is possible. Thanks to the media, HBO, of course, Golden Boy and Krusher Promotions for giving us the opportunity to showcase again on HBO. I want to thank Gamboa’s team for taking the fight. It’s going to be a good fight, a perfect fight with two aggressive, strong fighters .The are the great height for each other and they both need this fight. We know if we lose, we will have to sit for a while. He loses and he has to sit for a while. The best thing for me is that I know that Gamboa is going to bring the best out of Jason. Loma is a special talent. One like that comes every ten years. We fought. Loma, when no one wanted to fight him. We relinquished our WBA title to take that fight, which says a lot about that young man. Russell Peltz I thank you for believing in us. I want to say Happy Thanksgiving to everyone. I know that you are missing your family like we are. And for the fighters in general, like Jason said, they cannot have three meals and enjoy the family and the Thanksgiving. This sport is very demanding with time. So thank you for taking your time. It’s going to be tough, going against Russell Peltz and Jolene Mizzone [Main Events’ matchmaker] on the same night! But I want to thank Peter. Everybody is thanking everybody. Of course, thanks to the media, thanks to the fans, thanks to Madison Square Garden; it’s a privilege to be here. But Peter, thank you for not focusing on those pretty records, for focusing on fighters that want to fight and bringing them back even after a loss or two because these are fighters that want to fight. I’ve got to disagree with Russell on one thing. In this fight, the super featherweights, they have a lot in common to the main event. All four fighters know what a loss or victory means for their career. In all four cases, neither can afford a loss. In one case, the winner goes on to fight for a world title. In the main event, the winner will walk out a world champion. You all know Gamboa. You know what he can do. He’s a special fighter. It’s all about preparing. They put in the hard work. He is more than ready. What an event this weekend. I know everyone’s thanking, this is the right time to thank HBO. Peter, thank you for believing in Yuri and giving him another opportunity. To Golden Boy thank you for bringing Gamboa back. The guy has fought four times this year when previously in the last four or five years, he’s fought only four times of five times. Thank you Golden Boy; you’re going to see a great fight this weekend. Gamboa is definitely ready. We’ve got one of the best in the world and we thank him for taking on the challenge. Gamboa has put in a lot of work and you’re going to see it this weekend. Thank you again everybody and thank God for the opportunity. I think of this like our Thanksgiving boxing dinner, where we have an amazing appetizer that whets our appetite for the rest of the meal. With all due respect for Russell, we’re now going to move on to the main course and the dessert. The light heavyweight division is on fire right now and we really can’t get enough. We’re excited to feature a second top fight in the light heavyweight division as our co-feature Saturday night. Cuban Sullivan Barrera is 20-1, 14 KOs and former WBA Interim Light Heavyweight World Champion Felix “Mangu” Valera is 15-1, 13 KOs of the Dominican Republic are making it a hot island showdown. This bout is presented by Main Events in association with Shuan Boxing Promotions and we’re very happy to work with them. Sullivan is ranked #1 one at light heavyweight by the WBA. If he can defeat Valera, Sullivan will be first in line for Dmitry Bivol’s WBA Light Heavyweight World Championship belt as the mandatory challenger. Sullivan is another distinguished amateur, a former member of the Cuban National Team who defected from Cuba in 2009. He quickly made a name for himself in the light heavyweight division winning his first 17 bouts, with 12 of those wins coming by way of knockout. Good afternoon everyone. Thank you for coming. My English is not very well, but I would like to try. I’m so happy for this day here at The Garden. Thank you to HBO, Peter Nelson and my promoter, Main Events. This weekend is a great weekend, Thanksgiving. We work hard at the gym to put on a great show for the fans, the boxing fans. My opponent, Felix Valera, I respect him. He’s a great boxer too. We will put on a great show for the boxing fans. Thank you everyone, and see you Saturday. Hello to everyone, I hope you all have a great Thanksgiving. I’d like to thank Peter Nelson, HBO, Madison Square Garden, our promoter Main Events and Luis Molina, our manager. I’d also like to thank Sullivan, because I tell you he’s a pleasure to work with. We’ve worked hard to be here. I’d like to thank Team Valera for accepting the opportunity. Like he said, it’s cold here but we’re going to bring the heat on Saturday night and we will put on a show for the fans. Sullivan will have his hands full with Felix Valera, a knockout artist with 13 knockouts in his 15 professional wins. His only loss is to the man waiting in line for the winner of this fight, Dmitry Bivol. This is the first professional bout in the United States for Felix. You can’t do much better starting out making your US debut in Madison Square Garden. First, I want to thank Main Events, HBO and my promoter, Shuan Boxing. I feel happy to be here, feel happy to put on a good fight and Saturday night you’ll see a good fight from me. For me, it’s an honor to fight such a great fighter like Sullivan Barrera. It’s also an honor to want to fight all the best in the light heavyweight division. We’re happy to be here in the United States, providing a showcase for Dominican fighters. Everybody will see he’s talented and he belongs on this level. I also want to thank Main Events, Shuan Boxing and HBO. I feel we’re actually fighting the best fighter in the light heavyweight division. It’s only my opinion once again, no disrespect to nobody. He’s from a long Cuban boxing school. He’s a great counterpuncher; he’s got power. He’s been down and got up off the floor to win by knockout. So in my opinion, we have the toughest fight in the light heavyweight division. Coming through Saturday the way that we planned it, I feel we are on top once again. To me, Sullivan Barrera is the best in the light heavyweight division. We prepared very well for him. Thanks to him and thanks to Main Events for giving us this opportunity. 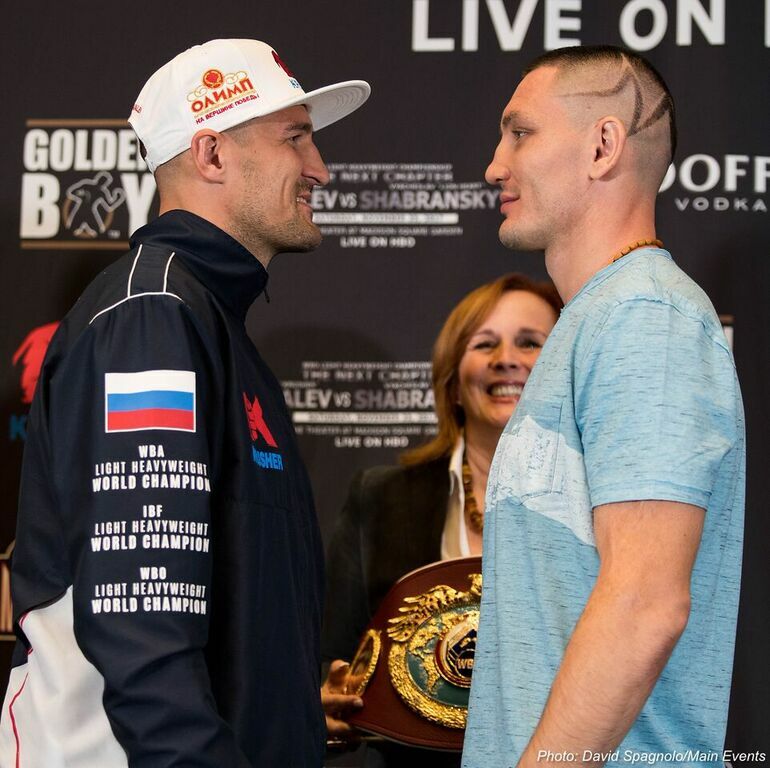 When we put together Sergey Kovalev’s first fight in The Next Chapter of his career, he wanted it to be memorable and exciting: a real test of his new approach and attitude. We found the right opponent in a guy with the longest nickname in boxing, and it says everything about his come-forward style, Lion Heart. It’s such a pleasure to be working with different promoters putting their best against our best fighters. At the end of the day, you’re going to get the best fights and the fans are going to walk away happy. Jolene [Mizzone], you owe me. This is a tremendous fight. I want to thank Team Krusher for this opportunity. Utmost respect for you and your team, Egis, we go way back. This is a real fight. This is a real fight because of what it means to both fighters. Put the world title aside, which is very meaningful, this fight means the next chapter, not only for you, but also for Slava. We are very confident because he has a good team behind him. Thank you all for being here today. I’d like to thank HBO, Main Events and, of course, Golden Boy. Thank you very much, for the opportunity, for my fighter here, Slava, to fight for the world title. I just want to say, we had a great camp, great sparring. It was probably the best camp we’ve ever had. I’d like to thank everyone for being here today and I wish everyone a great Thanksgiving. Saturday night we’re going to walk away with the world title, God willing. We’re well-prepared and we’re ready for, with all due respect to Kovalev, we’re ready for everything that may come our way. First I want to thank my promoter for believeing in me and giving me the opportunity to fight the best. A fight in Madison Square Garden alone is a dream come true. I’m now fighting for the title, it’s an amazing feeling. I’m working really hard to be where I am now. I’m ready, let’s go! Finally, our former unified light heavyweight champion in the main event sits here today knowing what it is like to feel thankful and to understand the importance of teamwork. Sometimes life delivers a hard lesson but you can learn and move forward. You can be stronger and wiser. You can reach your goals for a second time in life. How many of us can say we’ve reached the very top even once? Sergey Kovalev has been a world champion. He rose from nothing – you all know his story. There is no reason to believe he can’t do it again. It will be exciting to watch it happen. I think it will be even more satisfying for us than the first time we saw it. We have heard from a lot of people who have talked to Sergey and watched him these past few weeks during training – including many of you. They have pulled us aside and told us how amazed they are at his change in appearance and his change in attitude. When Sergey defeated the great Bernard Hopkins, Bernard told Sergey right after the right he would be world champion as long as he wanted to be. He was right – Bernard is always right! I you don’t believe me, he’ll tell you! It turned out the only person who could really beat Sergey Kovalev was himself. Now that he has learned this lesson, he is ready to begin the next chapter. Everyone in the light heavyweight division should be very, very afraid of what a focused Sergey Kovalev can do. Hello everybody, good afternoon. Welcome to New York City, Mecca of Boxing, Madison Square Garden. As always it is a pleasure to be here. I wanted to thank everybody and I want to thank, just not to repeat it, and repeat it again, I want to thank everyone who put in an effort to this fight. I’m very honored to represent a different, a completely different Sergey Kovalev than what I knew in 2009. In the beginning of his career, he was very patient and we walked very long road to get into the position. After he became a champion, he started doing thing a champion isn’t supposed to do. He didn’t pay much attention about his training; he was always on his own. He was trying to tell trainers and everybody what to do, how to do. After every fight, he used to go back home to Russia, spending, two or three months there until he’s going to get a next fight. Finally he got that last call, which reached his mind. I was trying to give some advice during his career but he didn’t pay much attention. He just walked on the other side and did what he’s supposed to do. Usually we can’t give to a grown man advice; he’s not going to take it seriously until it reaches into his mind. He got that bell. Somebody told him, ‘you’ve got to stop it. You’ve got to go a different road if you want to go somewhere in this life.’ I’m very happy, I’m really happy to represent a different Sergey Kovalev. On another note, as soon as I walked in today to Madison Square Garden, Robert Diaz stepped to me and he said, ‘You know what, Slava got a phone call when he landed in New York. His wife called him and said guess what? Our children are playing. Both their children playing in the background and the two men are going to step in the ring and going to fight each other.’ That’s a wonderful story. I’ll see you guys on Saturday night, have a good time. No matter what any of us say, no matter what Sergey says, whatever story we have to tell you, what really matters is what we’re all going to see Saturday night. That is really the only thing that means anything .Up until that moment, we have to wait. Until then, it is my privilege to introduce the newly energized and focused Krusher Kovalev. Hi everyone, I’m happy to be here at Madison Square Garden and Happy Thanksgiving to everyone. I want to say thank you to HBO for this opportunity to get back on this level of boxing, where I can prove for myself who I am. Also, thank you to my manager, to my team, to Kathy Duva and to Madison Square Garden. I’m here fighting for all boxing fans, here and worldwide. I want to thank God, that he blessed me, and that I’m still alive, that I’ve reloaded and got a lot of new motivation in my head, mentally. From my last losses, I didn’t break. These losses didn’t break me mentally. It was a good experience for me. I should follow my goals on a clear road without any wrong things, any baggage on my back. Right now, I want to thank Golden Boy Promotions for this fight and especially for Slava Shabranskyy. I respect this guy because he’s a real fighter. His nickname proves he’s a Lion, a Lion Heart, and we will show you on Saturday a great fight. Because on top of this will be the WBO title. From the WBO title, I began my first successful boxing career. I will repeat it and after this we can speak of my future boxing career. Thank you to everyone who came here. I love life; I love boxing. For boxing people, this is hallowed ground. Every time I walk in the door here, I remember the first time I came here. It was more than 40 years ago. Main Events is about to celebrate our 40th anniversary next year if you can believe that. Many of you weren’t born yet. I remember being here and I took a picture of Joe Frazier. He actually stood right in front of me, I had my camera and I took a picture. It’s still hanging across from my desk. I look at it every day, black and white and fading, but it’s him. There’s one thing you gain from having this many years on you, experience. It’s learning that life is nothing but a series of reinventions. Those who can continue to reinvent will thrive and those who can’t will fall behind. The reinvention begins on Saturday. As you all go off to your Thanksgiving dinners, I want to ask all of you to think about these fighters. They won’t be, as Jason pointed out, be sitting down to a big meal because they have make to weight on the scale Friday. God knows Jolene hopes they all do! This is a rough assignment during a holiday like this. Tickets starting at $50 and are still available through Ticketmaster and Madison Square Garden box office for Saturday’s event. Or you can watch live on HBO World Championship Boxing® starting at 10 p.m. Eastern and Pacific. We have a lot of people here behind the scenes giving up their holiday. They’re working hard to put on an entertaining night of boxing for your Thanksgiving weekend. I want to particularly make a shout out to every member of my wonderful staff: Jolene, Nicole, Alexis, Lisa and Joe. I want to make a shout out to Ed Keenan, our trusty sidekick and to Gayle Falkenthal who is pinch-hitting admirably for Ellen. We all have her and her family in our thoughts and prayers. She’s going through a rough patch. Hopefully she’ll be back again too. I think it’s only appropriate as we’re all giving thanks, that we give these people a big round of applause, please. And to all of you because I know you’re all working today too and we’d rather not be. So thank you for coming.